Can Mars become a habitable planet in near future? Well, NASA scientists have come up with a proposal to deploy a giant magnetic shield around the red planet to make it habitable for future generations of human colonists. ‘Life on Mars’ has been one of the most discussed topics among scientists, who have been studying the red planet to find out if it is habitable. Now, NASA scientists have come up with a proposal to deploy a giant magnetic shield around the red planet. The magnetic shield will protect the atmosphere of the red planet from solar wind. This could make Mars habitable for future generations of human colonists. Researchers said that the magnetic field of Mars suddenly disappeared about 4.2 billion years ago, causing the atmosphere of the red planet to slowly be lost to space. They said Mars became wetter, then cold and uninhabitable from being a warmer planet over the course of the next 500 million years. Mars will continue to be a cold, dry place where life cannot flourish, because it lacks this atmosphere. Also, NASA hopes to mount future crewed mission by the 2030s, which will have to deal with some severe hazards. One of the most difficult challenges to deal with will be exposure to radiation and the danger of asphyxiation, which will pose an even greater danger to colonists. NASA’s Planetary Science Division (PSD) in Washington recently held a workshop in which Jim Green, Director of NASA’s Planetary Science Division suggested positioning a magnetic dipole shield at the Mars L1 Lagrange Point. An artificial magnetosphere could be formed that would encompass the entire planet, thus shielding it from solar wind and radiation, he said. “In the future it is quite possible that an inflatable structure(s) can generate a magnetic dipole field at a level of perhaps 1 or 2 Tesla (or 10,000 to 20,000 Gauss) as an active shield against the solar wind,” Green said. The positioning of this magnetic shield would ensure that the two regions where most of Mars’ atmosphere is lost would be shielded, ‘Universe Today’ reported. To test this idea, the research team conducted a series of simulations using their proposed artificial magnetosphere. These were run at the Coordinated Community Modelling Centre (CCMC), which specialises in space weather research, to see what the net effect would be. 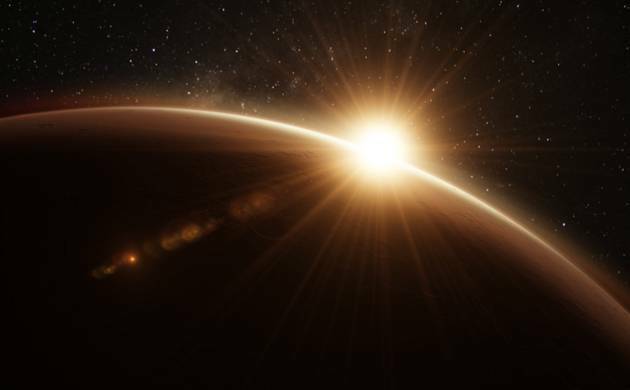 What the researchers found was that a dipole field positioned at Mars L1 Lagrange Point would be able to counteract solar wind, such that Mars’ atmosphere would achieve a new balance. As a result, atmosphere of Mars would naturally thicken over time, which can lead to many new possibilities for human exploration and colonisation, they said.